The gentle side of Switzerland: It’s not all 4,000-metre mountains and deep ravines. On the Voralpen-Express, visitors discover a different kind of Switzerland – undulating hills, picturesque villages and lovely orchards. The Voralpen-Express is the most appealing way to travel between Eastern and Central Switzerland. Starting from Eastern Switzerland’s urban centre of St. Gallen, whose Abbey district is a UNESCO world heritage site, the train traverses the 99 metre high Sitter viaduct and the rolling landscape of “Toggenburg”. Passing by Rapperswil and the impressive upland moor near Rothenthurm, the journey ends after a little over two hours in historic Lucerne on the shores of Lake Lucerne. All trains equipped with a bistro coach and vendor machines for refreshment. 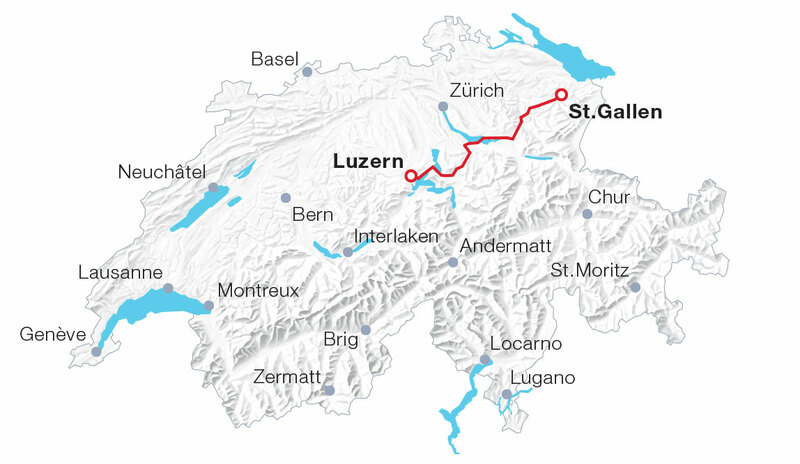 This route is fully covered by the Swiss Travel Pass (Flex) and GA travelcard. No seat reservations possible – free seating.